Invisible cars from benz working with F-cell technology ~ Engineering projects ideas for final year students & paper presentations collection blog. We all know the premium car manufacturer Mercedes-Benz who is a multinational brand. who works on all kinds of automobile like buses, cars, coached and trucks too. Now the company which excels in its research and development has taken its vision to the further that we were watching in the bond movies. In the even of promotion for its prototype fuel-cell in germany, the company made one of its B-class hatchback invisible! Yes, it made the car invisible! 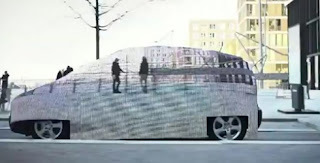 The invisibility cloak which was covering the body of the car was made by employing a dozen of technicians and $263,000 worth of flexible LED fixed of mats covering one side of the car. On the other side the car had a good camera which shot the images and telecasted on the led mats at the right scale. The technology we all watched in "Die another day" and fascinated, here is comes. According to the company the main motto was to show the F-cell hydrogen fuel cell powered cars. which would be producing 0.0 emission to the environment. It produces only water vapor and heat for its emission. 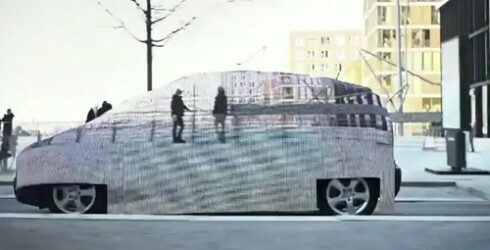 What is this news spoken for: The invisible car, we saw in "Die another day" is coming on streets soon. What was Benz's intention: Understand the power of "F-cell hydrogen fuel cell powered cars"